Thank you all very much for your entries to AFAM-Dates. I will be posting the roundup around Dec 10th. Till then, do keep sending in your entries. I owe you all an apology. Due to a very hectic work schedule, I have not been able to reply to any of your mails or visit any of your blogs. I have got all of your emails and I really appreciate it. I will get back to all of you in a couple of days. I am not a fan of Diwali, thanks to the fire crackers. To be honest, I don’t remember enjoying fire crackers even as a kid. My mom, dad and sister fall into the same category too. Before you think we are some sort of outcasts in the world of festivals, let me clarify that we love the spirit of Diwali and celebrate it with light, like all others. Except that we light lamps, rather than the noisy and dangerous fire crackers. As a kid, walking down the streets of Vellore to my school a couple of furlongs away, was a nightmare during Diwali. Kids and grownups alike start bursting crackers in the narrow streets thronging with people, blissfully aware and conscious of the dangers the passerbys face. This menace starts a week before Diwali and continues for a week after and has been the same for the past 20 years. One of my school friends got hurt by a ‘Lakshmi bomb’ during one of those walks. Even now, I pray for my mom and dad’s safety during the Diwali season even though travelling in a four wheeler provides shelter to some extent. I know you might think that I am being paranoid, but imagine the consequences when these potent bombs are placed in the hands of innocent kids, who are not supervised by elders. Even the colorful rockets and the seemingly harmless sparklers are deadly. We have heard enough horror stories of burns and blisters and in some cases even worse. I am not against fire crackers, but I believe that their use must be regulated. Fire crackers are beautiful, amusing inventions when they are set off in an open space, away from public harm. 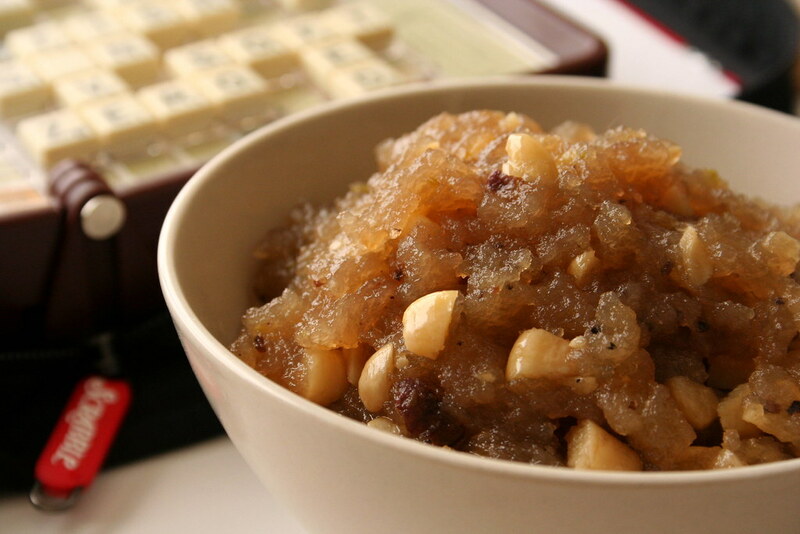 Wheat halwa is traditionally made by soaking wheat grains for 24 hours and grinding them to extract the wheat milk. The reason behind it is to use only the starch and not the gluten. I found a shortcut using wheat flour instead of the whole grains. Read on to find out…. Using a little water, make a firm dough with the wheat flour. Place the dough in a deep vessel and add water so that the dough is just immersed. Keep it aside for 30 mins. After 30 mins, start kneading the dough, taking care to keep it immersed in water. White, milky, starchy extract will start to ooze out from the dough and the insoluble gluten can be felt as thin strands. Discard the gluten. Knead the dough till all the gluten has been removed and filter the milky extract. Any left out gluten will settle in the filter. To the milky extract, add about 1.5 cups of water and keep aside for 20 mins. Next, discard the top most 1/2 cup of the clear liquid, without disturbing the settled milk. Take a thick bottomed sauce pan and add the sugar. To it, add 1/4 cup of the remaining clear liquid and heat on a low flame till a one string consistency syrup is formed. Switch off the heat at this point for a couple of minutes and slowly pour the milky extract into the syrup along with the lemon juice, stirring all the while. Switch on the heat again on a mid flame and keep stirring till the mixture thickens. Start adding the ghee two tablespoons at a time, whenever the mixture sticks to the pan. Halwa is done when the ghee seperates out and the mixture comes together as a semi solid mass. Add the cardamom powder and the broken cashewnuts to the halwa and stir till well blended. Serve as such or mold to the desired shape. When using sugar, check the sweetness. I have found that different brands of sugar have different sweetness levels. Holly brand of sugar found in Costco is sweeter than the Domino brand. This yummy halwa goes to JFI – Jihva Special Editon : The Festive Series hosted by gracious Vee of Past, Present and Me. and to Monthly Mingle – Traditional Feasts hosted by lovely Meeta of What’s For Lunch Honey?. Thank you for accepting my late entry, Vee. WISH YOU AND YOUR FAMILIES A VERY HAPPY DIWALI! Hope you have a wonderful, fun filled time! AFAM (A Fruit A Month) is a wonderful event started by Maheswari of Beyond the Usual, to highlight fruits. Till now, AFAM has seen Banana, Orange, Pineapple, Apple, Watermelon, Peach, Lychee, Grapes and Strawberry. Needless to say, our wonderful blogger friends have brought out the best in all of them. This month, I have chosen DATES! Back home in India, Dates are very common. But if you are wondering where to find it here, look no further than the dry fruit sections in your grocery stores. Popular brands like Dole and Sun Maid offer both pitted and chopped dates. 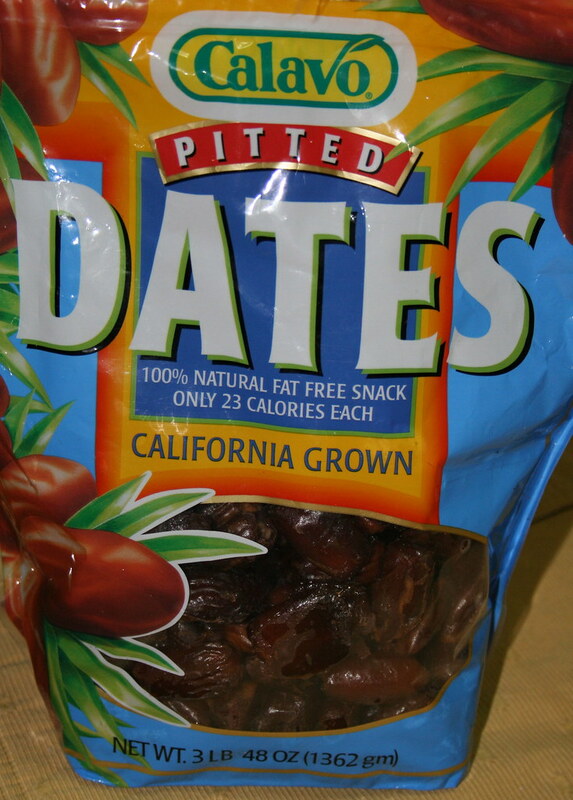 Though fresh date fruits are available in the markets seasonally, the dried version is more common. Fresh dates ferment very quickly, while dried dates have a longer shelf life. 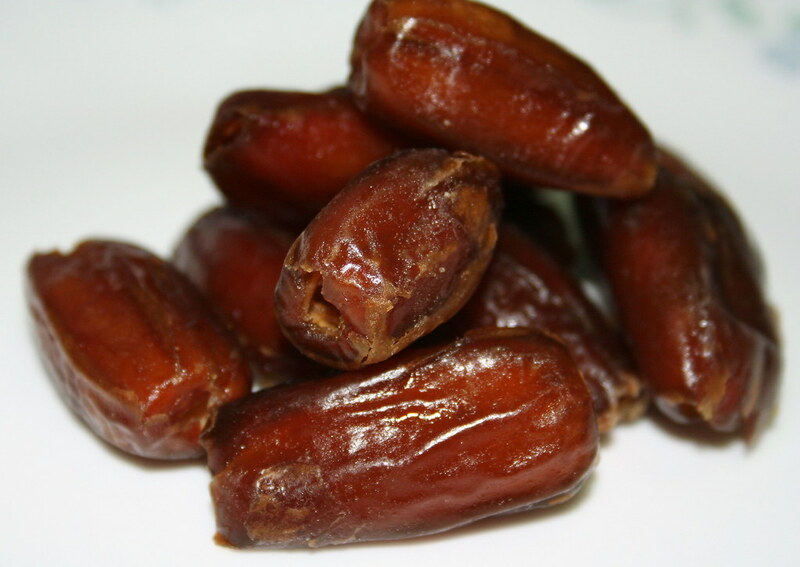 So, roll up your sleeves and create wonders with dates! 1. Prepare a dish using fresh or dried Dates in any form. 2. Post the recipe in your blog from now till December 1st, 2007 and provide a link to this post. Non-bloggers can directly send me an email with the recipe and picture. 3. Send me an email (chandrika@inbox.com) with your blog name, blog link, perma link of your post and the picture of the recipe. Please use ‘AFAM-Dates’ as the subject in your email. Do not bother about resizing your pictures. Send them to me as is. I am eagerly looking forward to all of your wonderful entries to make my first blog event a success! About the fruit Peach, there is only one word which comes to my mind – luscious! Until now, I have not tried anything with peaches. From the farmer market’s, they go straight to our stomachs, after a quick wash. But for Mansi’s AFAM-Peach, I decided to make a tart. I found a very simple recipe in Food Network in Sandra Lee’s Semi Homemade Cooking section and I adapted it. Thaw the puff pastry sheet as per the directions given on the Puff Pastry package. For Pepperidge Farms brand, the pastry sheet has to be thawed for 40 minutes. While the pastry sheet is thawing, drain the liquid off the canned peaches and thin slicely lengthwise. Keep aside. After thawing the sheet, unfold and place it on an ungreased baking sheet. Fold the edges on all four sides for a rim. Prick holes inside the rim to prevent the puff pastry from puffing up. We want the rim to puff up and form a border. 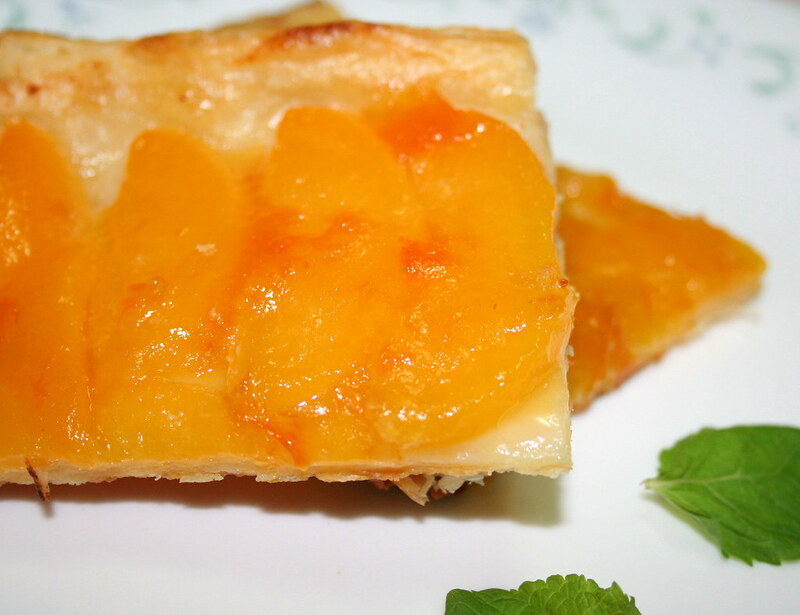 Next, arrange the peach slices on the pastry sheet in a single layer. Sprinkle sugar all over the fruit and dot with butter. Brush the rim with a couple of drops of milk. Now the tart needs to be baked. Preheat the oven to 400 degree Fahrenheit and bake for about 15 to 20 mins or until golden brown. While the tart is baking, microwave 2 tbsps of apricot or peach jam for about 30 seconds and keep aside. After the tart is baked, remove from oven and while it is still hot, brush the melted jam all over the tart. Let it cool and enjoy! 🙂 The tart is very light and airy and would go well with a hot cup of tea.